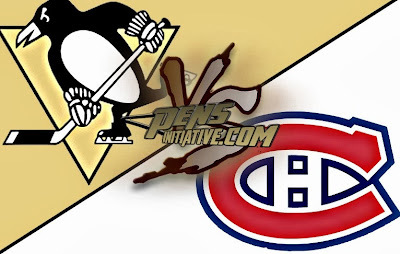 Even with a late push in the 3rd period the Montreal Canadiens managed to defeat the Pittsburgh Penguins on home ice last night by a score of 3-2. Carey Price continues to make his bid for the starting spot on Team Canada's roster at the upcoming Olympics while Marc-Andre Fleury. This period was a battle of goaltending. 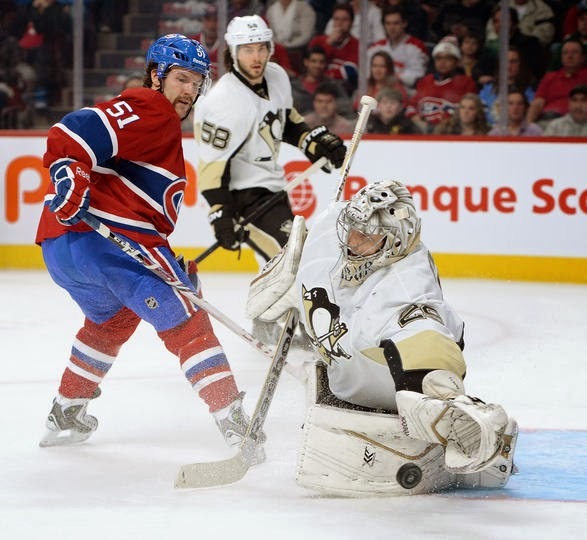 Both Flower and Price were both very busy stopping all 12 shots that were fired at both ends. That was not the only impressive thing in this game. Like him or not, P.K Subban and Markov were incredible. Say what you will about PK, but man did he own Crosby last night. It seems like getting under Sid's skin is still his kryptonite. That is not to say that Sid didn't get his share of chances, but he no doubt didn't control his game or composure they we have seen recently. He also looked like he never took a faceoff in his life. Subban, though hated can't be over looked. As the one Canadian here in the PI family I no doubt would have him on my drawn up Team Canada roster... Yeah, I still dislike the guy.. But if you think he isn't a solid player you are probably lying to yourself. And that's okay because he is a goof.. Though there were many chances in the period, this might have been the closest of the first as the clock was winding down. Almost 2 minutes into the second period the Habs would get on the board after Max Pacioretty would put a wrist shot behind Flower. Montreal would take the lead 1-0. After that the Penguins started to get into penalty trouble. Though the Canadians didn't make them pay for one of them it no doubt let them control the period having outshot the Pens 11-8. Though they tood 3 penalties pretty close to one another, Flower really managed to keep the Pens in this one, scraping out of the period only trailing by one goal. The Penguins got their 3rd power play opportunity of the game when Brian Gionta took a two minute minor for hooking Pascal Dupuis. No doubt if the Pens wanted a chance to get back into this game they needed to capitalize on this PP and they did. 5:44 into the period James Neal would get a PP goal and his 3rd of the season. The Pens continued to put pressure on the Habs outshooting them in the period 11-6. With a little less then 3 minutes in the period there was some hope and fear at the same time. James Neal would score to make it cut the lead by one goal. On the play Malkin would get the assist(22) and just took control of the play but crashed hard into the boards. He was shaken up but did return to the game. Though the penguins would continue to push it was not enough. They would just come short and lost 3-2. Though the Pens really pushed, this was a game where they were outplayed by goaltending and solid defense. Pens were 1/3 on the power play and killed off all 4 penalties. They out hit the Habs 30-17. The Pens play their next game on Monday in Boston. The game is set to start at 7:00.